The busy holiday season is here, but you also have a race to train for. How can you stay motivated to squeeze in your training runs between big meals and seemingly endless shopping? Here are a few tips to help you fit it all in. Most runners don’t log 100% of their planned mileage during the holiday season. That’s perfectly ok. Many experienced coaches will say that if you can get 80 to 90% of the planned workouts in, you’ll be in great shape. Shorten some workouts if you have to. A shorter workout is better than no workout and it will help you to stay on track. Plan your training schedule accordingly. Whether you’re working with a 1:1 coach or have a generic plan, you’ll likely want to plan your highest-mileage weeks to NOT be in the middle of your busiest travel week. Plan for your busiest week to be your recovery week for running, during which your planned mileage is lower than your average. If you have to skip a run, skip the shorter, easy runs. Try to keep the hard workouts and long runs in your schedule for maximum benefit. You can move them around if you need to. When moving workouts around, just remember not to plan a hard interval session and a long run on back-to-back days. If you’re traveling for the holidays, check in advance for running routes or a gym at your destination. Pack running clothes for indoor or outdoor running accordingly. 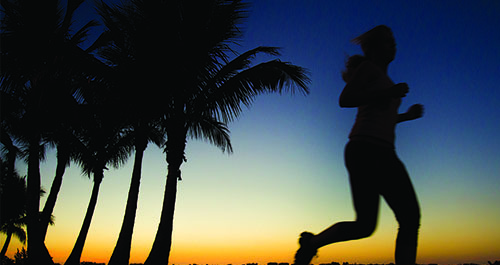 Getting up for an early morning run might be the best way to squeeze in workouts on busy days. Hydrate well. If your holiday parties include more alcohol than you’re used to, plan for extra hydration as well. That could simply mean drinking more water, or having a tasty electrolyte beverage during the day. Make sure you enter long runs and hard workouts well hydrated for best performance and safety. Plan some fun seasonal runs to bring more enjoyment to your winter training. Plan a route touring neighborhood holiday lights. It’s a fun way to run in the dark and still enjoy the holiday scenery. Dress for safety with bright colors, reflective gear and a headlamp. Look for a shorter race to test your fitness prior to the big event. There are plenty of holiday themed runs to try out. Embrace the season by streaming a holiday-themed channel for music during your indoor runs. Get a jumpstart on New Year’s resolutions by finishing off your 2014 with a solid fitness routine!